MOSCOW (Reuters) – A controversial economist and former presidential candidate who accuses the West of conspiring to turn Russia into an economic colony has emerged, sources said, as a leading contender to take charge at the country’s central bank.Sergei Glazyev, a Kremlin economic adviser, is being linked to the post a month before a deadline for his boss Vladimir Putin to nominate a successor to Sergei Ignatyev, who retires on June 23 after 11 years in the job. Some insiders have been quick to write off Glazyev, who during his presidential run in 2004 lambasted Putin for running “a corrupt and irresponsible regime”. Yet the speed with which Glazyev’s star has risen since he endorsed the Russian leader’s bid for a third Kremlin term a year ago has caught attention. One high-ranking source in Moscow’s liberal economic establishment said Glazyev is viewed favourably by both Putin and Prime Minister Dmitry Medvedev. A second source confirmed his status as a candidate and a third said he might get the job. 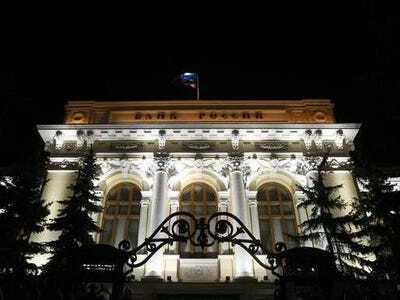 Putin’s spokesman, Dmitry Peskov, declined to comment on the central bank succession. Glazyev, appointed by Putin last July to advise on regional economic integration, was not available to comment on Thursday, an aide said. “Glazyev is under consideration because the others … do not suit either Putin or Medvedev at all,” the first source told Reuters, speaking on condition of anonymity. Economists still lean towards the view that Putin will plump for an insider, like Ignatyev’s deputy Alexei Ulyukayev, to complete the central bank’s shift to a policy framework based on Western-style inflation targeting. Yet the liberals, who have controlled the Finance Ministry and the Bank of Russia since Putin rose to power, are concerned that radical change could endanger Russia’s $2.1 trillion economy and the management of the world’s fourth-largest foreign reserves. They have collectively recoiled at the unorthodox views of Glazyev, 53, who was tasked by Putin last month with coordinating a new strategy to stabilise Russia’s economy if the world slides back into crisis. Those comments drew a prompt and withering response from Anatoly Chubais, a leading market reformer who worked in government with Glazyev 20 years ago and now heads Russia’s state technology fund Rosnano. “A person who argues in all seriousness that the United States and Europe are issuing money so that they can grab Russian assets on the cheap can be anyone, as long as he is healthy; just not an economist,” Chubais deadpanned on his blog. Russia’s leaders have expressed increasing concern that the central bank has focused too much on bringing down inflation, to the detriment of growth that slowed last year to 3.4 per cent – its lowest since the 2009 slump. The institutional stand-off intensified on Wednesday, when Ignatyev went public with claims that $49 billion – or 2.5 per cent of the national income – was illegally transferred out of the country last year. Ignatyev said that “one well-organised group” was responsible for more than half of the outflows, in what analysts said was a coded accusation that the Russian security services were complicit. Ulyukayev, the central bank’s first deputy chairman, agrees with Ignatyev that the economy is running close to capacity and has pushed back against easing policy until inflation falls. Other contenders, central banker Sergei Shvetsov – in charge of market operations – and former Finance Minister Mikhail Zadornov, now head of state bank VTB’sretail arm, share similar orthodox views. Also in the frame, but regarded as long shots, are VTB CEO Andrei Kostin and Andrei Bugrov, a former financial diplomat who now holds a senior position at billionaire Vladimir Potanin’s investment company Interros. Of all the candidates, Glazyev has been the readiest to say that the Kremlin’s call to boost economic growth rates to 5 per cent or more are realistic – and even to suggest that they lack ambition. In his January article, Glazyev wrote that Russia could boost growth to a rate of 8 per cent, while industrial production could surge by 10 per cent per year. Such views would get a favourable hearing from the pro-Kremlin majority in parliament’s lower house, who would need to ratify Putin’s choice. Ignatyev’s hawkish inflation stance drew hostile questions when he testified to lawmakers on Wednesday.